Halo LIVE from the Oscars from Sciton on Vimeo. Have your Halo laser at the clinic that had the first Halo in Australia. Eliminate years of sun damage with Halo. Reduce the future appearance of pigmentation from the deeper skin layers. Scars – acne and other causes. What is a Halo Laser? Halo is a hybrid fractional laser. In fact it was the first ever hybrid. 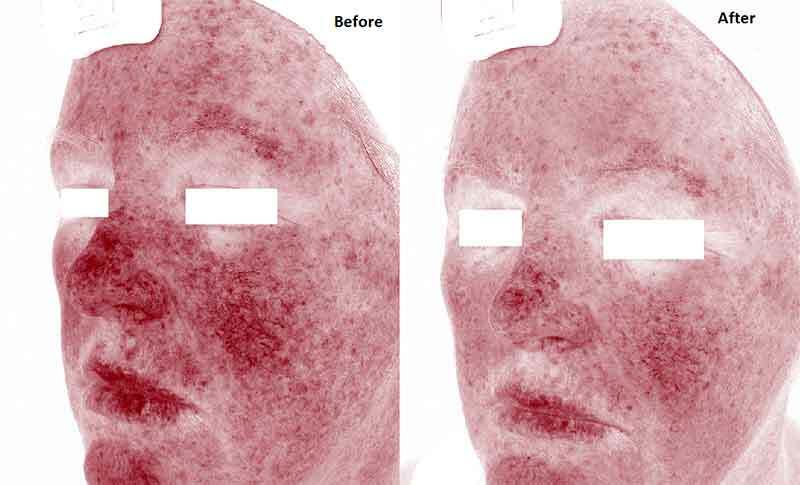 So, a fractional laser, is a laser that delivers the laser energy in a pattern of “dotty” channels across the skin. The advantage of this kind of energy delivery, is that we are leaving channels of normal unaffected skin between the treated channels, which allows healing rapidly across the skin, not just from under the lasered layer. This means much lower risk of any adverse marks or scarring, or stop start lines. It also allows the laser to shoot deeper than a traditional “peeling” or resurfacing laser, again, because of the safer healing pattern. 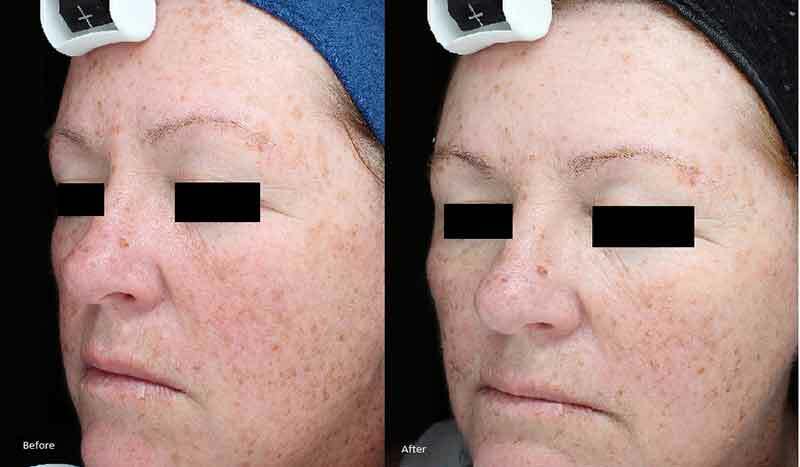 The first kind of fractional lasers heated up channels in the skin, didn’t burn the skin. This meant there was very little downtime, but also very small gains, and many treatments needed. Then fractional lasers were developed that burnt or “ablated” the channels of skin. This resulted in faster changes, but more downtime. In addition, some of these lasers could leave the “dotty” pattern on the skin for a long time after treatment. It also seemed that in some people who had many of these sessions (as may be needed for acne scarring), that the skin became “tough” and dull – even though the texture was smoother. Enter Halo hybrid laser. With this technology, 2 different laser wavelengths can be used at the same time – deeper heating rejuvenation and surface epidermal resurfacing. This synergistic effect means a multiplied effect. Skin looks bright and glowing afterwards. As we age our skin will experience changes in texture, colour and elasticity – especially in Australia where sun damage is starting to show even from about 25 years of age. Stress can also contribute to these changes, and our busy lifestyle can often contribute to that, adding unwanted years to our appearance. In addition acne scarring and enlarged pores can cause textural irregularities that change the way light reflects from our skin. Skin Wellness truly starts from the inside out, and we would always encourage our clients to discuss the ways diet, and lifestyle can improve their skin for the future. However we often need treatment to directly repair skin concerns we have developed in “living”! Halo laser is definitely a an effective cutting edge technology to improve so many areas of our skin. What is the downtime from Halo laser? Halo laser is talked about as having less downtime for results. Although this is true, it should not be confused with having no downtime. Also, the extent of the redness, puffiness, and flaky brown spots (M.E.N.D.S – Microscopic Epithelial Necrotic Debris) will vary dramatically depending on the density and depth of the settings used. This needs to be planned for your specific needs. Dr. Holmes will talk to you before hand about what settings may be needed to achieve your goals, and what you can then expect. Some younger patients having treatments to refresh early sun damage, for example, may have redness on the day, then slight puffiness the next day, but by 24 hours, with makeup over skin, visible effects will not be very obvious. Clients being treated for deep scars or deeper lines, may be swollen up like a soccer ball (really – if you are prepared, then no surprises!) the next day and remain quite swollen for 3-4 days, with marked shedding of MENDS. Still, almost very one is settled with possibly just little pinkness after a week. BUT compared to deep full face laser resurfacing, where healing times used to be 2-3 weeks, this is indeed, less downtime. Topical anaesthetic cream is used before hand, and integrated cooling technology is part of the device. The advanced technology in the Halo hand piece allows for continual temperature readings of the skin, and appropriate automated cooling in response. For most clients this means they will feel heat, that does become more noticeable during the course of the treatment, and some prickling and stinging in more sensitive spots. Of course deeper treatments will be more uncomfortable than lighter ones. Still, most people manage the process well. Immediately after the treatment when the cool air in removed, you will experience a super hot feeling for between half an hour to a couple of hours. Cold packs are recommended for this time. After this, the skin is warm for perhaps 24 hours, but that intense heat is gone. What happens immediately after my Halo treatment? Everyone travels through the same sequence or changes over usually 5-9 days. The strength of the treatment varies from client to client depending on goals and a customised plan. So, the post treatment experience will vary accordingly. Always there is a period or half an hour to several hours of feeling super hot. Your face is very red at this time. There may occasionally be a spot or 2 of bleeding but more often, no bleeding at all. The following day you will feel warm still, and have some degree of puffiness. After a light session, this could be barley noticeable, but after a strong treatment swelling can be quite marked (think “squinty eyes’, and round face like a melon). The puffiness will gradually reduce on the following days, as a feeling of sandpaper skin and the brown spotty appearance of the M.E.N.D.S appear. These gradually exfoliate off, such that generally, by 5-7 days, your skin is just little pink. You will be provided with a post treatment pack of products to care for you healing skin. Mineral Makeup after 24 hours is possible, particularly after lighter sessions. Dr. Holmes will review you about day 4. When will I see results from my Halo? You will see some improvement after 5-7 days, but your skin will continue to improve over time. We know that collagen stimulation will continue to roll on for months. The maximum pigmentation improvements will usually be seen in 2-3 weeks. ( See that Glow). But, it is not uncommon to see someone 3 months later saying they are continuing to see improvement in fine lines and texture. How many Halo treatments will I need? This will be planned specifically for the individual. It will depend on the goals and the settings used. You can usually choose to have one or two more aggressive sessions, or multiple less aggressive sessions to achieve a similar goal over a longer period of time. This is pretty much always the case in skin rejuvenation treatments of any kind. If you are told that a particular treatment has no downtime, and no pain, then you can guarantee you will need a long series of them over a period of time. If you are going to have some discomfort and some downtime, you will need fewer treatments to achieve your goals. There really are no free lunches!! How long will Halo results last? Your Halo results will last for years to come, but you should continue to keep your skin protected at all times using UV broad spectrum sunscreen to protect your investment! Each additional Halo treatment you get will only improve the results, giving you even better looking skin. We would recommend two to four broadband light treatments a year, and one Halo every year, or every second year. These two treatments work differently in the way they improve the skin, and have a fabulous synergistic effect. Can anyone have a Halo laser treatment? Anyone who has a medical condition that effects the skins ability to heal would not be a candidate. It would be best not to have a strong treatment is you are on anti-coagulant medication. If you have ever, even once in your life had a cold sore, it means you are carrying that virus in your system. It is possible that heat like a laser could trigger an outbreak. As a result, Dr. Holmes would always prescribe anti-viral medication to be commenced the day before the treatment in this case. We will also check before your first treatment, that you are not allergic to the anaesthetic numbing cream used for this. It would be difficult to have a treatment without numbing cream. Are there side effects from the Halo? Swelling, heat and redness after the treatment can be marked and is probably the most common issue. It can be minimised with nurofen, ice packs and sitting up right over the first night. Itching can be noticed on the 3-4 days as old skin is shedding. Discomfort/ warm face can persist occasionally for several days. Infection is not usually a problem, but as mentioned earlier, anti-viral tablets will be prescribed to prevent cold sores when necessary. Allergic reaction to the numbing cream is occasionally possible even after having a pre treatment test. A hive like reaction to heat is an uncommon possibility. 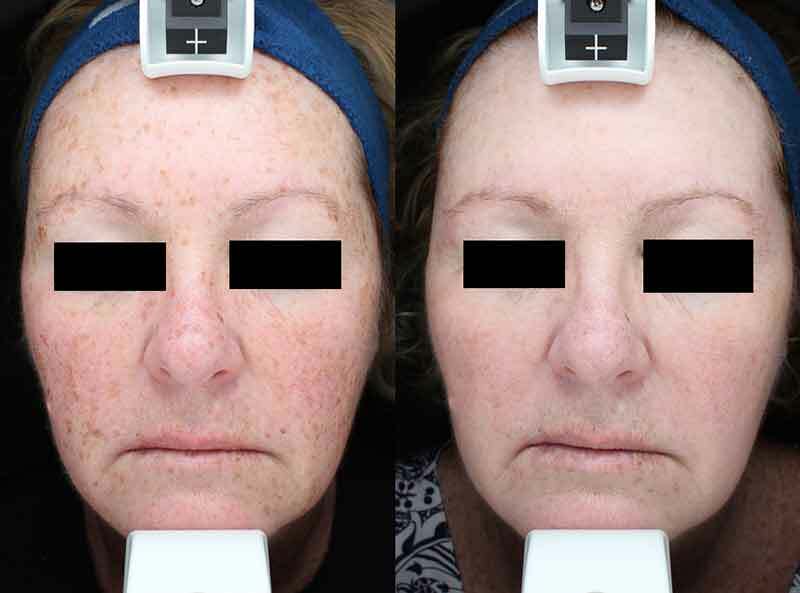 Post inflammatory Hyperpigmentation is uncommon with this laser but is still possible and can be managed by the clinic. Permanent colour changes are very rare. Prices will vary depending on the area to be treated. This will be discussed at a pre-treatment consultation. These covered here are our most common, and aim to give a guide.